Are you facing charges and need a criminal defense lawyer to protect your rights? Is your family involved in a difficult situation - one that calls for an attorney? Is civil litigation your only option for righting a wrong committed against you or your business? If you are in need of diligent representation in any criminal defense, family law, or civil litigation matter, we can help. "Congratulations to Richard F. Klineburger, III and D. Ryan Nussey for again achieving the recognition of Super Lawyers 2014 and Top Attorneys in the area of Criminal Law and Divorce and Family Law." 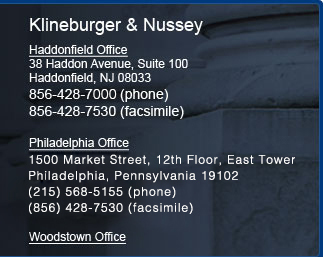 At the law firm of Klineburger & Nussey, our attorneys have stood up in defense of our clients' rights since our founding in 1997. From law offices in Haddonfield, New Jersey, and Philadelphia, Pennsylvania, our lawyers provide clients with extensive experience at both the trial and appellate court level. In fact, Richard F. Klineburger III is Certified by the Supreme Court of New Jersey as a Criminal Trial Attorney, while D. Ryan Nussey is Certified by the Supreme Court of New Jersey of New Jersey as Matrimonial Attorney. 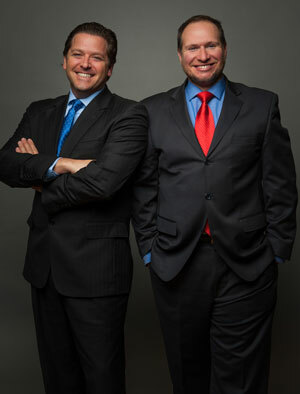 Rounding out Richard and Ryan are seven of the finest attorneys in New Jersey and Pennsylvania that focus on litigation and negotiation. Whether your case requires the need of a tenacious litigator or skilled negotiator, Klineburger & Nussey has an attorney ready and willing to advocate for you.